Why should a photographer want a graphics tablet for image-editing? It might seem as though your computer setup does everything you need it to when it comes to post-processing your photos, but actually a pen and drawing tablet can provide you with all sorts of advantages and generally make your editing workflow much more enjoyable. Whether you use Photoshop, Lightroom, or another editing program, a major advantage of using a tablet for photo-editing is that you can use a stylus to draw in your edits. This makes the process not only significantly more intuitive, but quite a bit more enjoyable as well, and the fact that many of the best tablets and styluses are highly sensitive and able to register up to 8,192 different levels of pressure means you can make adjustments with pin-point accuracy. Professional photo retouchers and editors use tablets to make their image edits, and you’ll likely find it really transforms how you feel about image editing. There are more advanced tablets and cheaper tablets available, but we reckon the best value for money for a tablet for photographers comes from the Wacom Intuos Pro Medium. Its rough, tactile surface and highly sensitive stylus make it an enjoyable experience to use the Intuos Pro Medium for editing, and the combination of Bluetooth and USB connectivity make it easy to boot the device up and start editing your images, whether you’re a Windows or Mac user. The tablet supports multi-touch gestures (pinching, swiping, etc), and its shortcut keys are fully customisable, allowing you to assign them the functions of your choosing. Also useful is the Touch Ring, which gives you quick access to your favoured commands and tools. Many photographers might assume that an editing tablet simply isn’t worth the cost, but when the Huion H430p can be picked up for less than £30/$40 you’d be foolish not to at least consider it! Though it can’t compare to the professional-geared models made by Wacom and others in terms of functionality, the H430p is a well-made little unit that does everything a tablet-editing beginner would need it to. It has a small but well-functioning drawing area, an impressively sensitive stylus for the price, and four customisable shortcut keys to streamline your workflow. Removing its standard “Pro” designation, Wacom introduced the Cintiq 16 as a more entry-level tablet designed to tempt photo editors who may not have taken the plunge on a tablet before. Though the price is still arguably a little steep, being many orders of magnitude more expensive than something like the Huion H430p, the Wacom Cintiq 16 is still a great entry-level buy and is perfect for a Lightroom workflow. It has Full HD LCD display is a pleasure to work on, allow you to directly work on the area of the image you are looking it – and this synergizes well with the included Pro Pen 2 stylus. Bear in mind that the 72% color gamut is lower than that of higher-end models, and while this shouldn’t be a problem for most straightforward photo edits, you may notice a very slight difference in how the image looks from tablet to computer screen if you’re using a high-end monitor. The bigger brother to the Intuos Pro Medium in our #1 spot, if you’ve got more budget to play with and like a larger drawing surface then it’s well worth considering springing for the Intuos Pro Large. It comes with the same level of customization and functionality, with ExpressKeys that can be set to control specific tools and controls, and it also supports multi-touch commands such as pinching and swiping. Despite its large surface area, the Intuos Pro Large is pleasingly thin and transportable, meaning you can also take your editing on the go. Like the Medium version, this tablet also includes wireless Bluetooth connectivity, reducing the number of cords and cables you need to fuss around with. A very good “cover-all-bases” tablet, the XP-Pen Artist 15.6 pen display gives you all you really need to start editing your images, at a great price to boot. It doesn’t quite have that tactile Wacom feel when you’re drawing on it, for photo adjustments and edits it does the job admirably. The ultra-sensitive stylus has 8,192 levels of sensitivity, and the ultra portable design of the tablet itself means it’s easy to pack up and take anywhere with you for editing on the go. 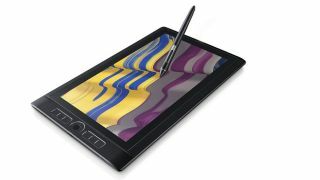 For a terrific balance between pricing and features, XP-Pen’s tablet is tough to beat. With the Windows 10 operating system actually built into it, the Wacom MobileStudio Pro 13 is a seriously powerful piece of kit. Its ultra-high-resolution 2560x1440 WQHD LED-display boasts 16.7 million colours and a colour gamut of 96% Adobe RGB, allowing you to view and edit your images in crisp, lifelike detail. You can use the included Pro Pen 2 to make your edits with pleasingly tactile precision, and if you want, you can even hook the MobileStudio Pro up to your desktop PC or Mac and use it as a pen display for an even more powerful setup. It’s easy to configure the ExpressKeys and Touch Ring to your preferred workflow setup, and you can also control it via the touchscreen. All this does have an effect on battery life, which could be better, but this is a seriously powerful tool regardless – with a price to match. For artists and designers, this is one of the most desirable tablets on the market right now, and it’s a fantastic choice for photographers too. The large 22-inch screen can display more than 16.7million colours, providing fantastic depth and richness of detail (even if the 1920 x 1080 resolution isn’t as high as we’d like), and it’s a terrific experience to draw on it with the Pro Pen 2. Like many other Wacom tablets on this list, the Cintiq 22HD features customisable ExpressKeys that you can assign preferred functions to, allowing you to streamline your workflow just the way you want it. It’s not cheap of course, but it’s an astounding piece of technology that’s great for pro-level editing. One of the best things about the Microsoft Surface Book 2 is that it’s not only a tablet but a laptop too, meaning you can tablet-editing to your skillset without necessarily having to up the number of devices you lug around. Its powerful Intel Core processors provide smooth and fast operation, while drawing on the large, high-resolution display with the Surface Pen is an intuitive and enjoyable experience (though be aware that this’ll cost you extra). If you can afford the steep initial asking price, you’ll find the Surface Book 2 a fantastic device for editing, processing and everything else besides. If you’re already into the Apple ecosystem, it makes sense to consider Apple’s iPad Pro as your drawing tablet of choice. If you’re willing to pick up the Apple Pencil 2 as well, it works magnificently as a graphics tablet for photo editing, no matter which program you prefer to use, and the pencil can be magnetically docked when not in use. This 12.9-inch version (there’s also an 11-inch) is magnificent for working on, its large Liquid Retina display providing class-leading colour accuracy, and powering operations is the A12X Bionic processor, which Apple says makes the iPad Pro faster than most laptops. Great for viewing and editing your images, the Samsung Galaxy Tab S4 is a fantastic tablet for Android users, and the fact that it comes with a stylus in the box means you have everything you need to get started right away. It’s a fairly pricey tablet, but having access to the range of editing apps for Android is an excellent advantage, and the crystal-clear 10.5-inch screen displays your images in crisp, perfect detail. Samsung also promises up to 16 hours of battery life with the Tab S4, meaning you can keep on editing on the go for longer, and it of course has a range of wireless and wired connectivity options.